Modern Healthcare is proud to present the 100 companies and organizations that have been named to its Best Places to Work in Healthcare for 2016. 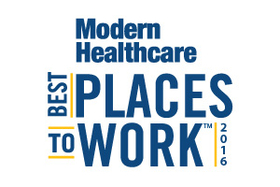 Modern Healthcare will reveal the ranked order of the 100 Best Places to Work at an awards dinner on Oct. 6. Find out which firms made this year's list.